Measures, Length .125 Inch (3.175mm), ID ..250" (6.35mm), OD .500" (12.7mm), wall thickness aprox .125" (3.175mm). 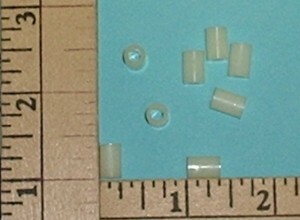 Will fit fasteners up to 1/4" (up to 6.35mm). Measures, Length ..375" (9.5mm), ID .141" (3.63mm), OD .250" (6.36mm), wall thickness .054" (1.37mm). 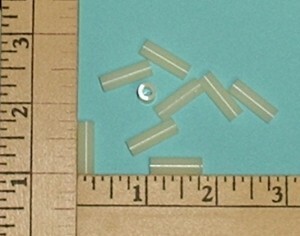 Will fit fasteners up to #6 (up to 3.5mm). Fits up to #6 fasteners (up to 3mm). 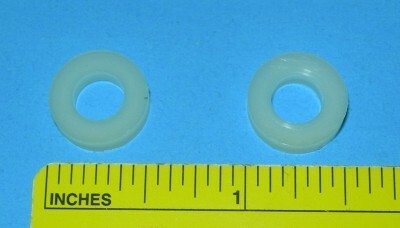 Measures, Length .500" (12.7mm), ID .173" (4.4mm), OD .247" (6.28mm), wall thickness .037" (.95mm). Will fit fasteners up to #8 (up to 4mm). Fits up to #8 fasteners (up to 4mm). Measures, Length .750" (19.05mm), ID .143" (3.62mm), OD .247" (6.28mm), wall thickness .052" (1.33mm). Will fit fasteners up to #6 (up to 3.5mm). Fits up to #6 fasteners (up to 3mm). Measures, Length 1." (25.4mm), ID .139" (3.56mm), OD .312" (7.95mm), wall thickness aprox .088" (2.24mm). 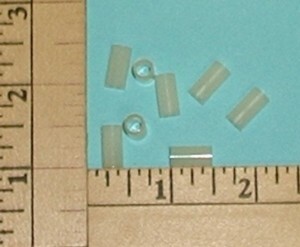 Will fit fasteners up to #6 (up to 3.5mm). Fits up to #6 fasteners (up to 3mm).